Are you the Communications Consultant we’re looking for? Do you have a passion for being in the know? Do you start every day getting up to speed on what’s happening in your city and around the world? Does the idea of working with a wide range of clients from a variety of industries excite you? Then this job may be for you. Elettra Communications is full service communications agency that offers stakeholder communications, media relations, event management, and social media services. Our clients include Granville Island, YVR, Emily Carr University, Cactus Club Cafe, Harbour Centre, and GWL Realty Advisors. We are a team of smart, informed, resourceful, quality-driven, and accountable individuals. We currently have an opening for a dynamic Communications Consultant. Planning campaigns, managing projects, and creating budgets, timelines and status reports. Producing compelling communications materials (written and visual). Executing media relations campaigns, which includes preparing written and visual materials, researching and crafting story angles, and pitching media. Preparing spokespeople for media interviews and assisting with formal media training sessions. Supporting the development of comprehensive event plans and working with suppliers to create top-notch event solutions. Handling event logistics, collateral production, and aspects of project management. Developing social media content calendars, creating content and managing paid ad campaigns. Working with videographers to produce compelling videos to support campaigns. Smart: You are sharp and quick-thinking. Informed: You’re a newshound who is informed about our city and our country. Resourceful: You are not daunted by obstacles or uncertainty. You simply find a way to get it done. Quality-driven: You are dedicated to producing work of the highest standard. Accountable: You keep your commitments. You take responsibility and ownership over your work. Bachelor’s degree in Communications, Business, Arts, Marketing, or Public Relations. 3-6 years’ direct experience in a public relations or communications environment. Exceptional writing skills. You write clear and sophisticated prose in a variety of styles. Experience in communications project management, working with multiple suppliers, managing timelines and budgets. Strong knowledge of regional/national media landscape. Proven success in conducting media relations campaigns. Experience developing social media content calendars, creating content and managing paid social ad campaigns. The following are considered assets: Adobe Creative Cloud proficiency; photography skills; WordPress skills; experience with video production; agency experience. This is a permanent, full-time position. While we encourage work-life balance, the nature of our industry means that you will occasionally be asked to respond to media/client inquiries and work at events outside of the 9-5, Monday-Friday work week. Demonstrate your exceptional writing skills by sending a well-crafted cover letter and resume to careers@elettra.ca. Are you the PR Consultant we're looking for? Do you have a passion for being in the know? Do you start every day getting up to speed on what’s happening in your city and around the world? Does the idea of learning something new every day thrill you? Then this job may be for you. We are a team of smart, informed, resourceful, quality-driven, and accountable individuals. We currently have an opening for a dynamic PR Consultant. Participating in campaign planning and handling day-to-day project management including budgeting, timelines, and status reporting. Producing compelling communications materials (written and visual) to support campaigns. Executing media relations campaigns, including: preparing effective written and visual materials; researching and crafting compelling story angles; and successfully pitching media. Preparing spokespeople for media interviews, and assisting with formal media training sessions. Developing social media content calendars for clients, including paid and organic content. Preparing written and visual content. 3-5 years’ direct experience in public relations. Proven success with conducting media relations campaign. Highly adept at, and engaged with, social media. Full time, permanent. You must be flexible with hours and able to respond to media inquiries and work at events outside the 9-5, Monday-Friday work week. Salary will match experience of the successful candidate. Expected start: Early September 2017. Applications submitted without a cover letter will not be accepted. Application closing date: July 10, 2017. More Awesome Now, the collective who brought Vancouver its first reimagined alleyway, Alley-Oop, is asking for the public’s help to fund an interactive art installation in the city’s next activated laneway – Ackery’s Alley. The collective is launching a Kickstarter campaign to raise the $35K needed to secure FIELD, an interactive public art installation by renowned international artist, Alex Beim. Once transformed, Ackery’s Alley (located off Granville Street in the alley behind the Orpheum Theatre) will be a space for public art and performance, with FIELD at its centre. The installation’s field of sensors and lights will detect the presence of a person, changing colours and emitting sounds in reaction to movement. FIELD will work like a large musical and light instrument that creates a unique composition every time someone moves through it. More Awesome Now will use the funds raised through Kickstarter for the procurement and installation of FIELD. The collective has already raised funds to transform the alleyway with artful signage, psychedelic paint, a metallic gold feature element, projection walls and a glowing orb beacon. More Awesome Now is a collective of thinkers and doers who reshape underutilized urban land spaces into engaging, accessible public spaces. The group includes the Downtown Vancouver Business Improvement Association (DVBIA), HCMA Architecture + Design, in partnership with Vancouver Civic Theatres and the City of Vancouver’s VIVA Vancouver program. More Awesome Now hopes that the concept of reimagined alleyways takes on a life of its own, so that one day Vancouver and other cities around the world have a connected system of colourful alleys that are places of human connection. The Kickstarter page will be live for thirty days, ending on the 12th of July. Ackery’s Alley and FIELD will be completed and ready for the public to enjoy by the end of summer. Elettra Communications (www.elettra.ca) has an immediate opening for dynamic, well-rounded PR Associate. We’re looking for the communications total package – someone with superior writing skills, media relations know-how, and social media savvy. And if you’re an events wizard, that goes a long way, too. The position is full-time, permanent. Act as day-to-day contact for clients. Participate in the development of PR strategies. Handle tactical execution of PR campaigns from start to finish. Develop a variety of communications tools and content, including media materials, social media content, articles, web copy, speeches, and client correspondence. Build targeted media lists – local and national. Develop effective pitches and successfully generate media coverage for clients. Develop social media strategies and content. Develop messaging and provide guidance and coaching to spokespeople. Work with senior team members on issues management strategies and develop key messages. Handle event coordination responsibilities for client events. A dynamic, energetic, and enthusiastic personality. Aptitude for BOTH creativity and organization. 1-3 years public relations experience. Exceptional writing skills. You must be a great writer who can develop compelling, sophisticated prose in a variety of styles. Previous media relations experience with a track record of successfully generating media coverage. High level of digital literacy, including facility with all major social media channels. Experience in social media management, content development, and monitoring. Exceptional media literacy and an unwavering thirst for knowledge of current events. A love for, and strong interest in, the city of Vancouver. Flexible with hours and able to respond to media inquiries / attend events outside the 9-5, Monday-Friday work week. Skill in photography, InDesign, and Adobe Illustrator considered and asset. PR agency experience is an asset. Applicants are asked to send their cover letter and resume to info@elettra.ca. The posting will remain open until the position is filled. During her free time, Sara enjoys photography and writing and exploring the city to find new restaurants. She is very passionate about food and visually showcasing food. When she isn’t with camera in hand, you can find her curled up on the couch with a good book or planning a new adventure. Through her years at BCIT, Sara has become more interested in the communications industry and how event and digital marketing can help improve communications plans. These interests have led her to the joining the world of public relations in Vancouver. She will be joining us at Elettra for the next eight weeks working on everything PR. She can’t wait to put her BCIT knowledge to work in the industry setting. Welcome to the team, Sara! As a British/Irish transplant in Canada (I’m from Northern Ireland) I had previously thought that the basics of PR would be pretty much the same no matter where one was in the western world. I was wrong. I learnt, I mean learned, that very quickly upon landing my first PR position in Vancouver. The first hurdle? Canadian spelling. A confusing mix of American and English, I didn’t even know there was such a thing until I started having to use it on a daily basis. And why doesn’t Microsoft acknowledge it in its spell-check options? After 16 months I think I’ve finally mastered the usage and it’s almost second nature now, however, I do fear my former colleagues and journalist friends back home may be silently judging me each time I use it in a Facebook post. PR Terminology. I’ve been met with my fair share of confused looks since taking up this position due to the terminology I use. Here what I previously referred to as a Diary Note is a Media Advisory. The content I normally used in the Notes to Editor section below my press release is now used in a fact sheet. Photography. Back in Belfast our main goal was print media. As a small region with very limited regional radio and television programming, most of which was taken up with political reporting, generating broadcast coverage was rarely achievable no matter how compelling the client’s story may be. However, the golden rule for getting plentiful print coverage in Belfast was to have a quirky, colourful image accompanying your media release….featuring at least one attractive female. Hence, no matter the story - whether it be business, trade or lifestyle - a model was generally booked for a photo shoot and I was off on the hunt for props and costumes. Here in Vancouver I have had more contact with broadcast media in the last 16 months than I did in 6 years in Belfast. There is definitely more human interest content on news shows here. It can be the daily newspapers that are the hardest nuts to crack. Quirks aside…the biggest challenge was learning an entire media market from scratch. Radio and TV call signs also stumped me for a bit but in time I’ve become familiar with the various channels, their programming and the types of content they carry. The last 16 months have been a fantastic learning experience and this has greatly widened my outlook and made me more adaptable and flexible in my role. Having the opportunity to gain experience in your chosen industry in different cultures and countries is something I would thoroughly recommend to anyone. Two months ago I began my internship at Elettra. I’ve somehow time warped into my last week, because it feels like yesterday was my first day. That being said, I’ve been fortunate to accomplish a lot in eight weeks. Between helping out with events, drafting communication tools, creating social media content and putting together media kits, it’s been an exciting time. For the sake of being short and sweet, I won’t recap everything I’ve experienced here. Instead, I’ll share the top three lessons I’ve learned. Lesson 1: Know your industry Completing PR school in Toronto, I was curious about how Vancouver would compare. If I’ve learned one thing, it’s that practical skills are only as valuable as your knowledge of the industry. Being a good writer means nothing if you don’t know who to pitch to, or how to address your audience. At Elettra I spent plenty of time familiarizing myself with the Vancouver media landscape – studying local newspapers and blogs, scanning for coverage, and composing media lists. Lesson 2: Be detail-oriented I was lucky to experience the Pacific Centre Make an Entrance fashion show from planning stages to event day. I quickly learned how important attention to detail is, as we examined every angle of the event – from what to do if it rained, to what kind of skirting to use on the runway. Simone warned me, be ready for anything. If you can imagine it, it can happen. Behind the scenes, the ladies of Elettra were prepared for any possible situation. This meticulous mindset resulted in a successful and memorable event. Lesson 3: Think creatively Throughout my internship I also worked on creating social media content for Harbour Centre. In agency you’re forced to think creatively, as each client has a unique set of needs. The challenge here was crafting content that’s appealing for their audience, while remaining relevant to current news and events. Generating ongoing, original content encouraged me to explore new methods of thought. Team brainstorm sessions certainly help with the creative process. Thankfully I was able to listen and contribute to quite a few during my internship. The fantastic part about Elettra is their collaborative environment, which breeds excitement and innovation within the team. So that about sums it up. It’s hard to list only three takeaways, because I’ve learned countless things during my internship. I owe a huge thank you to the ladies of Elettra for offering me their knowledge, insight and support. As for me, onto the next chapter of my PR story! You can reach Jenny on LinkedIn here. 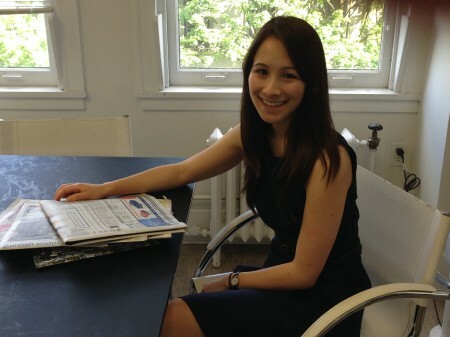 Elettra Communications is excited to welcome our new intern, Jenny McKenzie, to the team! Jenny recently earned her post-graduate degree in public relations from Humber College. Prior to Humber, she received her bachelor’s honours degree in communications from Brock University. While at Brock, Jenny completed a communications internship at Best Buy Canada Ltd. This position sparked her interest in PR, and encouraged her to pursue a career in it. Since then, Jenny has dedicated her time to building relevant knowledge and skills, inside and outside the classroom. In her spare time, Jenny is an avid sports fan and music buff. During her undergraduate degree, she was a committed member of the varsity volleyball team. Jenny has sought ways to pair these interests with PR, and her volunteer experiences range from sports PR to music conferences. Another passion of hers is travel, which led her to backpack across Australia in 2013. Originally from B.C., Jenny is excited to return to her roots in Vancouver. She is always seeking new challenges, and loves the diversity of PR. After dedicating many years to education, she is eager to see how her skills transfer from the classroom to the workplace. Welcome to the team Jenny! I can’t believe how quickly time flies. It seems like just yesterday I started my internship here at Elettra Communications, yet somehow I’m already heading into my last week. Working with a range of clients in a variety of industries, I’ve been lucky enough to have some pretty great experiences in my short time here. On my first day, I was able to help out with Harbour Centre’s Urban Grind. I got to meet thousands of Vancouverites that, through the power of PR, showed up to hike to the top of the Vancouver Lookout to enjoy some music, beers, and great city views. I also got insight into the back end of events like this by tracking the event’s success on a weekly basis and preparing a post-event report for the client. In addition to the Urban Grind, I was part of a team that celebrated all of the hardworking employees at YVR, promoting their new employee appreciation program: YVR Stars. I got to spend a morning handing out coffee, tea, and cookies to YVR employees coming in to work, while telling them about the YVR Stars program. On top of that, I was solely responsible for organizing the Chefs’ Showcase for this year’s Vancouver magazine Restaurant Awards. What does that mean? It means I got to spend a good portion of my days talking to the top chefs in Vancouver and inviting them to prepare some of their signature dishes to be presented to (and thoroughly enjoyed by) the over 900 guests at this year’s awards. This also means I got to work on a project that was 100% my own, from start to finish. That was a pretty good feeling. Plus, I got to catch a glimpse of the event itself - a room full of Vancouver’s finest from the restaurant industry coming together to celebrate each other’s successes. Aside from working on some pretty amazing events, my internship at Elettra has allowed me to put my writing skills to good use. One of the main reasons I’m in PR is because I love to write. Throughout my internship, my bosses recognized this passion and encouraged it by giving me opportunities to write blog posts, client articles, and social media content. I would also like to acknowledge some of the extra perks of working at a PR agency - the proverbial cherry-on-top of my internship. Working on the Vancouver magazine Restaurant Awards meant I was able to visit some of Vancouver’s top restaurants before the crowds got to them. I also got to hand deliver mail to some pretty great food trucks; needless to say, some delicious lunches were had. Additionally, I was able to attend this year’s Boink Day hosted by Spring Advertising where I learned I could bouce on a pogo stick over 30 times for a good cause! So there you have it, some first-hand insight into life as an intern. It’s been an incredible experience and I couldn’t have enjoyed it more. Of course, saving the best for last, I would like to thank all the ladies at Elettra for being so supportive and encouraging during my time here. I hope our paths cross again soon. And now, I’m off to find a job! We are very excited to welcome our new intern, Kelsi Carleton, to the Elettra Communications team. Kelsi is a second year Marketing Communications student at the British Columbia Institute of Technology and the Vice President of Operations at Enactus BCIT, a student run organization on campus. She has dedicated the past two years to her education and building her communication skills through participating in networking events, presenting at Enactus regional and national expositions, and attending local events to support the Vancouver business community. In her spare time Kelsi enjoys attending events including concerts, food truck festivals, and music festivals. She has a passion for travel and followed her passion by backpacking through Europe, Asia, Australia, and South America. Kelsi gained experience in communications during her time at BCIT. These communication skills, paired with her love of events were her drivers for joining the world of PR in Vancouver. She was drawn to the opportunity of working on a variety of clients in multiple industries. Kelsi has enjoyed refining her business writing and presentation skills in school and is excited to start applying them to the real world of public relations. Welcome to the team Kelsi! We are pleased to welcome Leanne Kedrosky back into the Elettra Communications office! Leanne first came to Elettra as an intern in March 2014. She completed a nine week internship as part of her BCIT Marketing Communications Program. Leanne then spent the fall coordinating our YVR School Tour Program at Vancouver International Airport. She had a two-part role, both as a tour guide for Grade 5 students visiting the airport and a support resource for our Airport Authority clients. Leanne has now taken on a new role as an Account Coordinator at Elettra Communications. We are thrilled to welcome her back into our office where she will provide support to a number of our clients including Vancouver magazine and YVR. We look forward to her continued growth within the company. Writing media materials, including news releases, fact sheets, articles, and web copy. Developing media lists, distributing media materials, and pitching stories. Responding to incoming reactive media inquiries. Monitoring media and developing campaign recaps. Monitoring social media channels on behalf of clients. Developing social media content and assisting in strategy development. Coordinating events and community programs, working with clients and suppliers. Supporting senior team members on a variety of communications projects. Supporting administrative functions of the agency. Contributing to Elettra’s social media profiles. Creating content for Elettra’s blog. Conducting research on a variety of topics. A Bachelor’s degree in Communications, Business, Marketing, Public Relations, or Arts. Previous experience (6 months – 1 year) working in a public relations agency or within a communications team. This can include internships. Strong media literacy and interest in local, national, and international current affairs and news. Active user of social media, including all major platforms. Experience in content development and monitoring. Exceptional writing and oral communications skills. A wealth of knowledge about, and passion for, the city of Vancouver. Flexible with hours and able to respond to media inquiries / attend events outside the 9-5, Monday-Friday workweek. Please apply with cover letter and cv to info@elettra.ca. After six weeks of learning about PR in the SFU PR Program, I felt like I had a solid ‘tool kit’ to prepare for my practicum at Elettra. In class, we learned a little bit of everything from media kits, pitching, and social media for PR, but there is only so much you can learn in a classroom. The practicum component of the course is a chance to give that newly developed ‘tool kit’ a try, and taking advantage of the opportunities that come with it, whether the opportunity is presented to you directly or not. When I started my practicum with Elettra, I had no idea how many opportunities would come my way. Direct Opportunities: The first day of any practicum or job is always nerve-wracking, so it was nice to find out that on my first day of Elettra I was given a list of smaller and lower priority tasks. These tasks were a direct opportunity to show my capability, even if it was on a small scale. In my perspective, every task that you are assigned is an opportunity to do well. Indirect Opportunities: Your practicum is what you make of your practicum. Yes, your supervisor will assign you tasks, but you also have the opportunity to find ways to go above and beyond those. For instance, my supervisors gave the team a brief overview on an upcoming project and let us know that there would be a brainstorm for ideas later on that day. Even though this was not “assigned”, I took advantage of some extra time I had, and did a mini brainstorm on my own. I essentially prepared a little pitch for my idea, anticipated problems and prepared answers for those problems. When I presented this to my supervisors at the brainstorm that day, they invited me to not only be part of the project but they also asked me if I would like to be hired on after my practicum to complete the campaign! This was a bit of a ‘aha’ moment for me, because I realized how initiative can help you make the best of your practicum and how you have the power to form your own opportunities. Reflection: The SFU PR program really helped me to start thinking from a PR perspective and gave me a little more confidence with the skills I had developed. My experience at Elettra was a fantastic way to learn in a supportive environment, a chance to try out my skills in assigned tasks, and a chance to take advantage of some really great opportunities. Beyond the Article: If you would like to see the campaign I helped with, take a look at Vancity Buzz’s page and the Harbour Centre website’s contest page. By Natalie Pope Natalie never considered public relations as a career option, but upon investigation she realized it was a perfect fit. Natalie is currently enrolled in the SFU PR Certificate and has joined Elettra Communications to complete the 3-week practicum component of the course. For the longest time PR was a mystery to me. But as a recent SFU Communications and English graduate, I learned that Public Relations is an area that many students in my field enter. As graduation approached, I began to chat with communications professionals from IABC and through various Vancouver events. I didn’t know what my career path would be but I did know that I love working with people, writing, social media, and events. After a lot of thought and self-reflection, I realized that PR was something that might indeed by a fit for me. I decided to act on this realization and enrolled in the SFU PR certificate program. Because of the program, I’ve learned relevant and hands-on skills that are integral to being a professional communicator. I also met many exceptional individuals including the industry-professional instructors and my classmates who will be the future of PR, I’m sure. The SFU English Department held an event called “What can you do with your English Degree?”, where SFU English Alumni spoke about their current profession. Simone was one of the speakers at the panel and she spoke passionately about how Elettra makes a point of finding meaningful opportunities that the team feels strongly about. This was something I was immediately drawn to and it was even more appealing when I found out how passionate Elettra is about providing exceptional learning opportunities for their interns or practicum students. Again, this was music to my ears. I am thrilled that Elettra Communications is part of my PR journey. So far, my journey into PR has been a path of discovery, and I look forward to continue learning and discovering during my time here! With summer fast approaching things are really heating up at Elettra HQ and we have lots of exciting projects on the horizon. To help us implement these campaigns we are delighted to announce a new addition to our team - Lorna Allen has joined Elettra as an Account Executive. Lorna hails from Northern Ireland and has an extensive background in PR and journalism from the UK and Ireland. Lorna holds a Bachelor of Arts in Humanities Combined and a Master of Arts in Media Studies – both from the University of Ulster. She has also completed a Postgraduate Certificate in Film Journalism from the British Film Institute, in conjunction with Sight & Sound Magazine, and is currently completing a Postgraduate Diploma in Online PR from the Fitzwilliam Institute. Elettra is delighted to welcome Lorna, and we look forward to introducing her to our clients and suppliers. By Leanne Kedrosky As my internship at Elettra Communications comes to a close, I’m reflecting back on how much I have learned, accomplished, and progressed over the past nine weeks. I started my time at Elettra with a faint inkling that public relations is in my career future, and I am finishing the internship with a solid conclusion that I want to be a PR star. How do you become a PR star? I have complied some of my favourite tips gathered throughout my nine-week internship at Elettra. The people make the job. The people at Elettra made my internship a highly enjoyable experience. I’m thankful to work with Managing Partners that made me feel like part of the team and were available for any of my questions. Personal relationships are important to the Elettra team and this reflects in numerous previous employees who have returned as clients. Choose accuracy over time. Take the time to triple and quadruple check you work! Clients will never appreciate sending off wrong or misspelled information; that time to check facts will save your reputation. Then when you think it is perfect, have someone else read it over. Mom was right, patience is a virtue. If a situation is tough take a deep breath, ask questions, and respond with a goal in mind. The people around you will notice how you respond to others and your future workload will reflect your capabilities. Write EVERYTHING down. From small tasks to weekly reminders, write it all down. As an intern you may be focusing on many things in a day, don’t let the small things slip out of your organizational grasp. Small is important. Doing a good job on small tasks will lead to more responsibility. Don’t consider any task unimportant. When you put effort into the small things it will be noticed, you will gain respect in the workplace, and slowly receive more responsibility and projects. Thank you to the Elettra team for teaching me so many valuable practices and helping me progress towards my career goals. I am looking forward to working here longer and absorbing more information from such a knowledgeable team. Acting as day-to-day contact for a variety of clients. Supporting Elettra’s social media profiles. Coordinating events and community programs, working clients and suppliers. 1-2 years direct experience in public relations. Experience writing media materials, building media lists, and successfully earning coverage in editorial media. Applicants are to send their cover letter and resume to info@elettra.ca. A hearty congratulations to Cassandra Parsons, who has been recently promoted to Account Manager at Elettra. Cassandra officially joined Elettra in August 2012 as Account Executive (with previous stints as an intern in 2010). The promotion recognizes Cassandra's hard work and stellar achievement in media relations and event production over the past year. Elettra Communications is looking for student volunteers to assist with Vancouver’s premier restaurant industry event. This opportunity will appeal to students who have an interest in public relations, publishing, marketing, or event management. 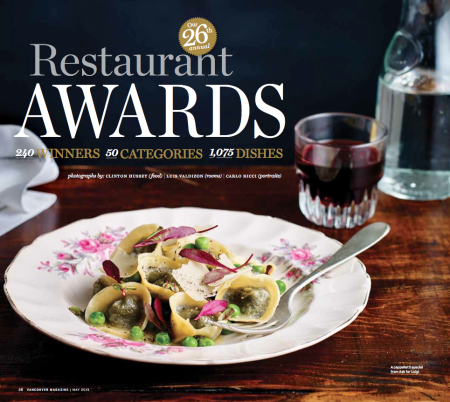 Now in its 24th year, Vancouver Magazine’s Restaurant Awards event is the biggest of its kind in North America. Twenty of the city’s top food critics form the judging panel and vote on the best dining experience in more than 40 categories. The event itself includes a reception and awards show. The annual extravaganza welcomes more than 800 restaurateurs, chefs, sommeliers, suppliers, and food and wine critics. Benefit to you: • Event coordination experience. • Exposure to the behind-the-scenes workings of a large event. • Opportunity to build contacts in the PR, marketing, and publishing industries. • Lunch will be provided. Dress code: All black. No jeans; no running shoes/sneakers. In your email please provide a brief introduction of yourself, and include a description of your current course of study and your contact information.